What Does Your Veg Garden Grow? I lost a month! Somehow with all the gloom and gray and snow, I was totally shocked the other night when I started thumbing through the Chicago Botanic Garden’s course guide, picked out a “spring” class that sounded good, and realized that the class had been held two weeks ago! OMG, it is the end of March and I haven’t given the vaguest thought to gardening (usu in February I’m even starting some seeds)! Foof, get it together, Queen Bee! One good way to get the month back, vicariously, is to ask people whose livlihoods depend on keeping organized, seasonally speaking, in the garden. One of those people happens to be my friend, Lisa Hilgenberg, who runs the Fruit & Vegetable Garden at (wait for it) the Chicago Botanic Garden. Awesome job, right? So…what is Miss Lisa–one of the most enthusiastic people I know–choosing to grow in 2014? “This year, it seems to be the unusual color of veg (Queen Bee: it’s spelled veg but pronounced vedge) that appeals to me and seems to also appeal to chefs. 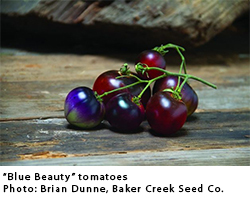 An example is ‘Blueberry Blend’ tomato, the new release from Wild Boar Farms in Napa, CA. created by Baker Creek. Wild Boar Farms offers not just one, but three blue anthocyanin varieties! 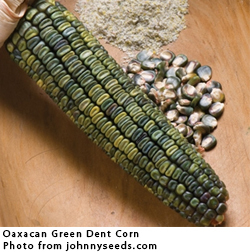 “We are also going to grow ‘Oaxacan Green Dent’ corn grown in Mexico for green flour tamales, which will be part of our ‘Three Sisters and a Sunflower’ planting. Another new veg is the ‘Falstaff’ Brussels sprout, which is purple with a mild, nutty flavor. I’m guessing from its name that is was discovered in England? 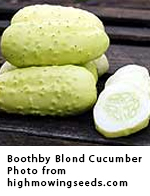 “‘Boothby’s Blonde’ cucumber has a nice story. It’s been grown by the Boothby family for five generations in Maine. This cuke is a fashionable old variety that the current Organic Gardening magazine highlights as pale yellow with bumpy skin and tiny black spines, like a science experiment. The Plant Giveaway in May are seeds of Boothby’s Blonde so you can see for yourself if it is. “There is a bush watermelon too that I’m pretty excited about. It’s called,’Jubilee’, and it has a mere 3-5’ spread producing an oblong 10-12 lb fruit! “And I’m really excited to grow a culinary collection of stir fry vegs: Evergreen Hardy white onion, cutting celery, Kailaan, Hon tsai tai, Joi choi, Osaka Red mustard, tatsoi and Dwarf Grey snow peas. 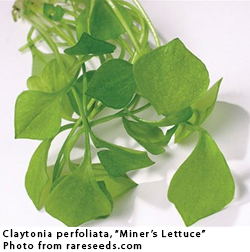 “And do you know Claytonia perfoliata? We are growing it right now, because it’s so tolerant of the cold spring weather”. Though I’ve heard of Miners’ Lettuce, I hadn’t thought of growing it, but it is perfect for us in Northern Illinois. With a cold frame, we could potentially have fresh lettuce all year. I’m on board with that!